Chinese takeout is pretty run of the mill. In the captial region, I’d say it’s generally below average. I always start exploring in a tight radius and then spiral out. The next nearest Chinese takeout place I’ve found is a place called Bamboo, located at 3770 Carman Road in Schenectady. Altamont. Guilderland. Whatever it is. I’ve actually gotten food from Bamboo a number of times and have been pleased with the chicken with broccoli I bought on those few visits. I decided to order a little more elaborately for the sake of the review. First off, the place is immaculate. The above image is telling. Every Chinese takeout place I’ve seen in my life has been gross. Seriously. 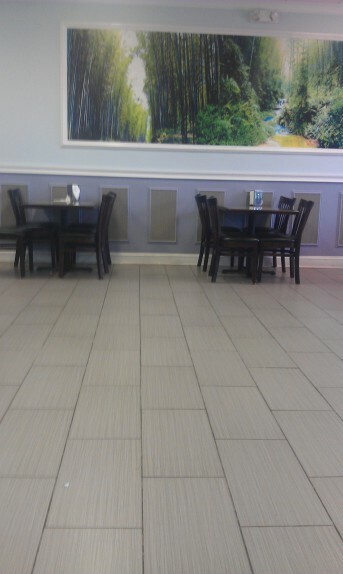 You don’t want to sit on the chairs or touch the tables; you just want to get your food and go. At Bamboo, the place is so inviting and clean, I want to eat there! 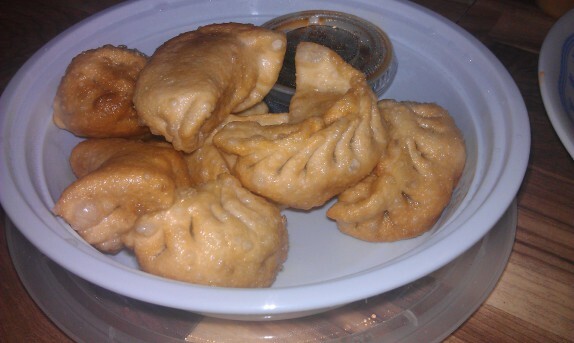 For this trip, I started with the fried dumpling appetizer ($5.25 – sorry kids, Menu not available online). Normally, these type of dumplings are wok steamed and then wok fried on the flat side prior to packaging. In this case, I believe (and I’m not sure) these spent a minute in the deep fryer after steaming, which is something different to me. The result was a nicely crisp dumpling all around. The filling is a seasoned beef and pork “sausage”-style mixture. The dipping sauce adds the salt that brings this together. Very nice. 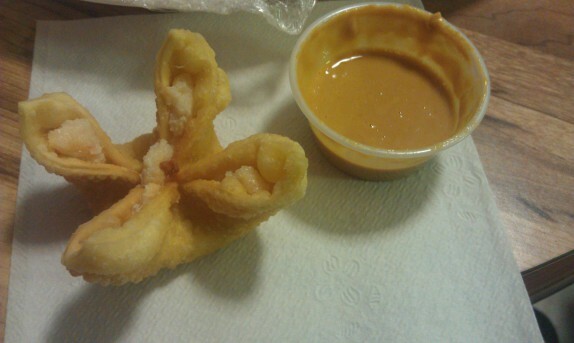 Cassie ordered Crab Rangoons ($2.95 for 6) that I got to try. The rangoon was extremely interesting. First of all, the presentation was very cool. They were nice and crunchy with a filling that was sweeter than I’m used to for crab rangoons; it wasn’t the usual tainted cream cheese filling. 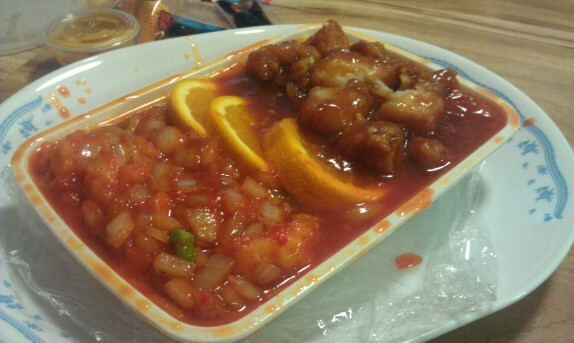 They served these with food-colored sugar, vinegar, and ketchup solution, I mean sweet and sour sauce. I opted to skip this and use their homemade spicy mustard, also in the above image. This stuff is amazing; it’s almost like the derryX sauce I make when I eat sushi. For dinner, I ordered Dragon & Phoenix ($12.95). That’s my diabolical way of trying two things without ordering two things. Without going too far into the philosophical meaning of the dragon & phoenix in Chinese folklore, the dish brings together two differing things in perfect harmony. I don’t normally order General Tso Chicken because of the stigma that the mall food court General Tso Chicken has created, but what lured me to this was the description of “All White Meat.” I don’t think I’ve ever had General Tso Chicken advertised this way. I ordered the dish extra spicy, because I find that Chinese takeout is not spicy enough. 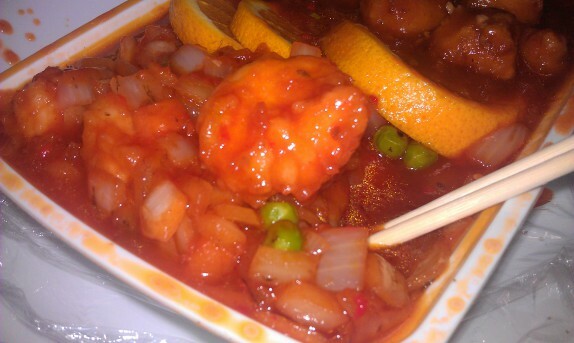 Hot and Spicy Shrimp, described as “Jumbo shirmp stir w. white onion, pea and carrot in spicy tomato sauce”. That was it. It wasn’t necessarily spicy. Very sweet, but, even though I ordered it extra spicy, it was not. It was good. The shrimp tasted nice, and I kept hunting under the oranges for more shrimp. The onion were diced too fine to enjoy, but they brought a nice aromatic flavor to the dish. The General Tso Chicken was interesting. The meat was all breast meat; this manifested in nice square chunks of chicken. There was too much batter on the chicken and too much sauce overall. The individual components were good; it was just a little saucy. This had a nice amount of heat. Another draw of this place for me is availability of brown rice. 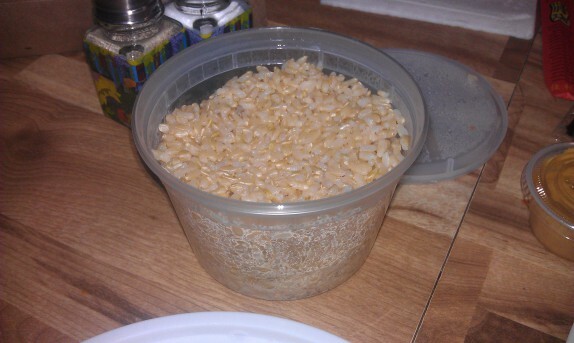 I try to eat whole grains where I can get them. Brown rice isn’t great, but it’s better than white rice. I actually prefer the toothy texture. They do upcharge $.50 to give you brown rice, but who’s gonna complain about that? Animals, that’s who. The one thing that is going to keep me a regular at this place, and you’re going to think I’m totally ridiculous about this, is the soy sauce and duck sauce packets they leave for you to take away. This hearkens back to a conversation I had with my cousin years ago. During this conversation, we concluded that WY was the best brand of packets you can find. There are a few with dragons and other weird creatures on them; when you pick these packets up, you can feel that they are inferior. The soy sauce is not as thick as WY and the duck sauce not as sweet. 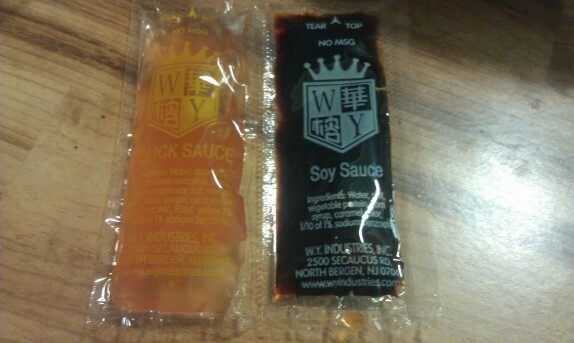 So, if you find WY packets at a Chinese restaurant, you know they are a keeper. Until this restaurant, 15 years in the Capital Region, I have not seen this brand. Ohh and they have chopsticks that you can take right near the sauces. Yerr. what it is is the soy sauce from Japanese places and others just is too strong. the watered down WY packets just add that soy flavor without the overly salted PURE soy. but the dichotomy here is YOU cant use WY for sushi.. just doesnt work. see these are the idiotic things we pay attention to. That’s a completely different discussion that you’re right about. I’m talking about the difference between WY packets and the packets with strange dragons on them. WY clearly tastes better than the dragons, and we had a long discussion about that, probably 10 years ago now. MAYBE the WY packets are better than the dragon ones, I don’t know. But seriously, it’s a crime to call those packets “Soy Sauce” when they only contain brown salty water. Dude. The ingredients are right there on the front. You are paying $13 for a dish at a restaurant that cares so little about their food as to have you sully it with that junk? Seriously, I’m appalled. Seriously appalled. Thanks for sharing this. I can now scratch Bamboo off the lists of places I might want to try. I understand that there is better out there, but in the realm of mediocre at best Chinese takeout restaurants, which, whether you want to acknowledge these places as a viable dining option or not, they’re out there, and they’re not all the same. I’m not going to defend the food more than just to say that the menu said they used chicken breast meat in the General Tso, and by God, they actually did, as opposed to the mystery chicken meat that you get in the mall or at other takeout closer to colleges. While I love places like Ala Shanghai and CCK (ok, adore), there’s still a spot in my heart for Chinese takeout, and that’s ok because we’re all human. I’m going to skip over the soy sauce on sushi rice thing for now to focus on the larger point here. Americanized Chinese food isn’t bad. 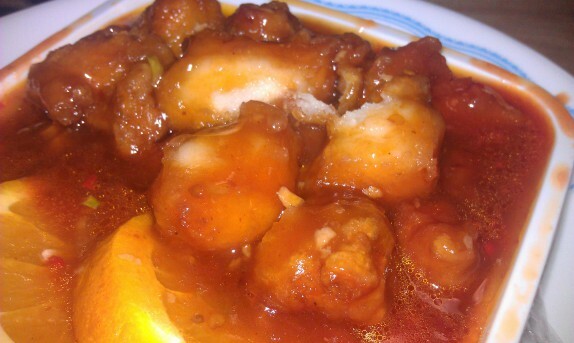 I have no problem with a good General Tso’s chicken enjoyed on its own merits. But it seems like you are making a distinction between good Americanized Chinese food and sh*t Americanized Chinese food. There was a place I used to go for $5 Chinese, that was occasionally $4 Chinese. I understand the quality differences between cheap and expensive places, and that not all cheap places are created equal. Paying over $10 for a dish at one of the better (aka not totally sh*t) takeout places that gives you packets of brown salty water labeled “Soy Sauce” is appalling. Mostly because for that price I would expect you can get actually good Americanized Chinese takeout, where they care enough about their food to give you soy sauce that, you know, is made from soy beans.